Big Red Car in the ATX, which is headed to 105F today – it looks like 112F on Monday. Hello, Texas summer! It hit 102F yesterday. So, the entire kerfuffle of Putin – a despot – meeting with our president got me interested in the history of US-Russia summits. Turns out there is a lot of history which is pertinent to the subject. What is particularly interesting to me is the first such summits. The players were Stalin, Nikita Krushchev, Vice President Nixon, President Eisenhower, and President Kennedy. The Allies met regularly during World War II. They met face-to-face to discuss regional and strategic issues. 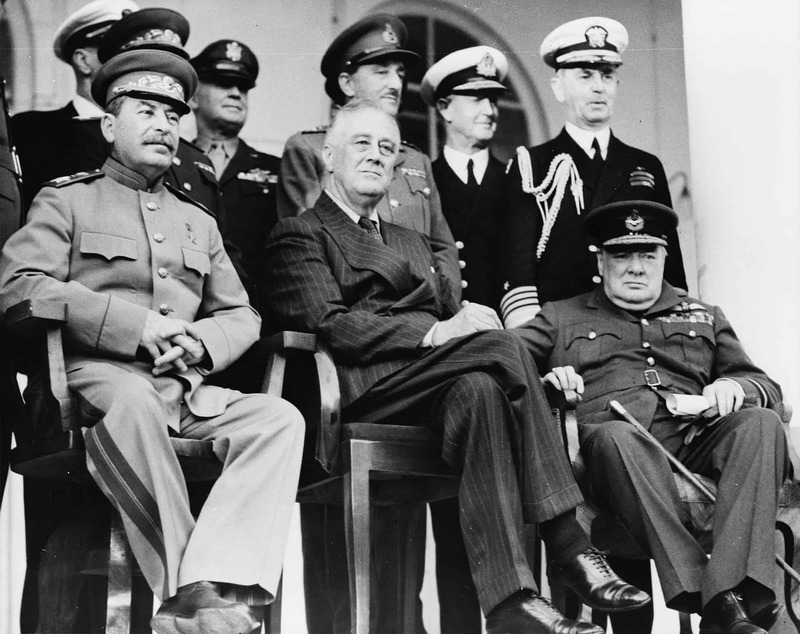 The Big Three (USA, England, Russia) met at the Tehran Conference (codename Eureka), Yalta Conference (Argonaut), and Potsdam (Terminal). At Tehran, President Roosevelt met Stalin for the first time. This was the first time a Russian head of state and an American president had ever met. At Tehran, the Allies agreed on the conduct of the wars against Germany and Japan as well as how they intended to establish post-war borders, reparations, and the disposition of colonies. Stalin, Roosevelt, Churchill at the Tehran Conference 28 Nov to 1 Dec 1943. By then, they believed the Allies would emerge victorious against both Germany and Japan. Roosevelt grossly misjudged Stalin. The Yalta Conference was held 4-11 February 1945 in the now liberated Crimea. It was attended by President Roosevelt, Prime Minister Churchill, and Premier Stalin. They agreed as to how Europe would be carved up after the defeat of Germany. 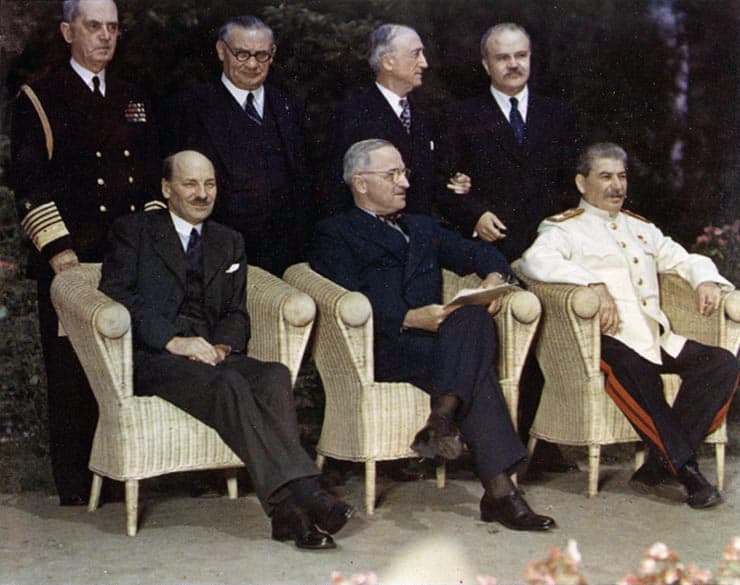 Yalta was the source of much trouble as Churchill and Stalin had met October 1944 without Roosevelt. They had agreed to divide Europe into Western and Soviet “spheres of influence” which would turn out to create the Cold War. In addition, the French (Charles de Gaulle) were not invited to either Yalta or the subsequent Potsdam Conference which created deep and lasting resentment which had a negative impact on the creation of NATO some years later. The Potsdam Conference was held in now-defeated Germany (8 May Victory in Europe Day) from 17 July to 2 August 1945. Roosevelt had died and was replaced by President Truman. Churchill attended the first half of the conference, but was replaced by the newly elected Prime Minister Clement Atlee. Prime Minister Atlee, President Truman, Premier Stalin at Potsdam in occupied Germany. Atlee was softer on Russia, a huge mistake. Truman was tougher on Stalin which turned out to be the right notion. After this conference, the Russians did not release any of the countries they conquered in the war and began what came to be known as the Iron Curtain which lasted until the disintegration of the USSR in 1991. The Allies were able to conduct their business to the successful defeat of both Germany and Japan based on the personal relationships amongst the three primary leaders. Churchill had a very tough view of the Russians which was softened by Atlee while Roosevelt had a soft view of Stalin which was toughened up by Truman. Subsequent events showed there was no case for trusting Stalin as he occupied all the countries the Soviet Army liberated from the Germans thereby starting the Cold War and creating the Iron Curtain. The Big Four – President Eisenhower, Prime Minister Eden of England, Premier Nikolai A Bulganin of Russia, and Prime Minister Edgar Faure of France met on 18 July 1955. During this summit, intended to reduce international tensions, Eisenhower proposed the Open Skies initiative which would have provided for the US and Russia to exchange maps delineating the exact location of every military installation in their respective countries. With these maps, each nation would be granted overflight authority to ensure compliance with arms control treaties. It was not accepted. The Geneva Summit is credited with starting the dialog amongst nations about global trade. President Eisenhower’s Vice President, Richard M Nixon traveled to Moscow in July 1959 to open the American National Exhibition in Moscow which was an exchange of American and Soviet exhibits as part of the 1958 US-Soviet Cultural Agreement. Nixon toured the exhibit with Premier Nikita Krushchev ending up with a series of debates between the two men, the most famous of which was in the kitchen of a model home which was priced at $14,000 and had a refrigerator, a stove, a range, and a dishwasher as well as a washer and dryer. The debates did not focus on military tension between the two countries, but rather their relative standard of living. Krushchev acknowledged that the US standard of living was higher than the Russians, but asserted that the Soviets would soon catch the US and surpass them. Krushchev invited Nixon to his dacha whereat they had an additional five hour debate. Unfortunately for history, this debate was not recorded. 1. Leading advocates of capitalism and communism discussed the relative merits of their systems. 2. Krushchev thought that Nixon was both “tough-minded” and “strong-willed” which he cited as the reason why the Russians tried to defeat Nixon in the 1960 election. Nixon lost to John F Kennedy in the 1960 election by fewer than 100,000 votes. The election was fraught with corruption in Illinois and Texas. Later, when Krushchev and Kennedy met in Vienna in 1961, Krushchev joked about it. Here is an article from the WashPo about it. 3. Eisenhower invited Krushchev to visit the United States, which he did. 4. Kruschev would turn out to be a shrewd judge of American leaders from Eisenhower to Nixon to Kennedy. He did not have a very high opinion of Eisenhower, but he feared his military expertise. In turn, Eisenhower did not have a high opinion of Krushchev. President Eisenhower invited Premier Krushchev to visit the United States for informal talks. Krushchev not only agreed to a summit, but he insisted on an extended visit including a tour of the country. 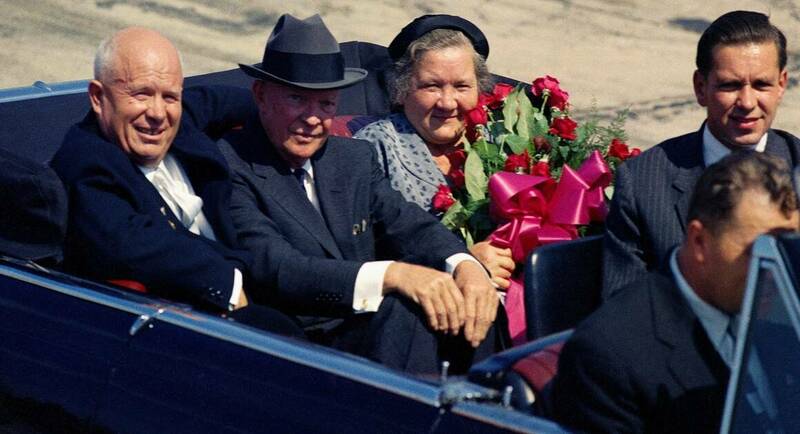 President Eisenhower looks thrilled with the ride back from the airport with Krushchev and his wife, Nina. Krushchev had three wives. Krushchev was the first Russian Premier to visit the US. Sergei, the Premier’s son, later wrote that “…these two old men, without resolving a single specific question, made a lot of progress in the most important area, the sphere of human understanding of each other. The first glimmers of trust became visible.” This person-to-person contact between a Russian Premier and an American President was critical to the Reagan-Gorbachev relationship which ended the Iron Curtain, brought the Berlin Wall down, and broke the USSR into its constituent states. The big issue of the day was the fate of Berlin. The Russians had tried to blockade Berlin during June 1948 and the Americans, British, French, Canadians, Australians, New Zealanders, and South Africans provided an air bridge which lasted until 12 May 1949 to feed Berlin. It was a significant demonstration of commitment to Berlin and freedom while being a demonstration of logistics and opposition to the Russians. 39 Americans and 31 Brits died in aircraft flying the Berlin Airlift to feed Berlin in the face of Soviet oppression during 1948-49. It was an incredible logistics effort akin to flying the Hump in World War II. It took a year, but the Soviets finally abandoned their blockade in the face of American and British resolve. Eisenhower intended to invite Krushchev to visit, but only if the issue of Berlin was resolved. The invitation, in error, did not include that condition, so Eisenhower didn’t object and allowed the visit to go forward. Berlin was not resolved until the Reagan administration years later. During the visit, which included a trip to Eisenhower’s Gettysburg farm, the President and the Premier were often alone together, sometimes without even interpreters. They spent a significant amount of time together with only interpreters. Krushchev ate his first hot dog in Iowa, had dinner with numerous stars in Hollywoood including Marilyn Monroe, visited a pig farm, visited the Empire State Building, but the low point of the trip was his failure to visit Disneyland because the US was concerned about his safety. [Mickey Mouse was an ardent anti-Communist and there is evidence that Minnie and Pluto were both armed.] Krushchev threw a temper tantrum. 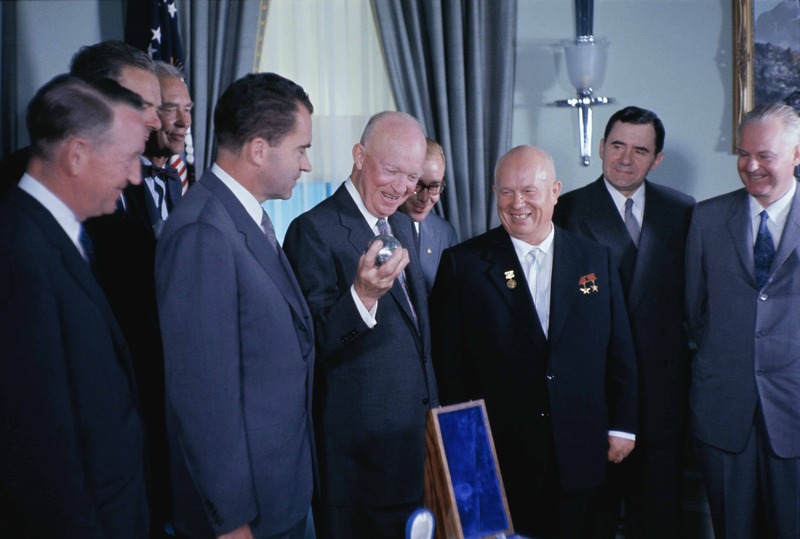 Premier Krushchev presents President Eisenhower with a replica of Sputnik, the first satellite ever launched into earth orbit. The Russian launch of Sputnik also launched the US space effort. Krushchev was screwing with Eisenhower and enjoyed it. The Krushchev visit to the US was considered a success – the “Spirit of Camp David” was the name given to the new thaw in US-USSR relations – resulting in a reciprocal invitation from Krushchev to Eisenhower to visit the USSR. Krushchev went to the trouble to build a golf course with a dacha for Eisenhower to enjoy. There were no golf courses in the USSR at that time. One interesting note was the visit to IBM’s headquarters where Krushchev saw a self-service cafeteria line for the first time. When he returned to Russia, he introduced self-service cafeterias to Russia. 1. The U-2 Incident (1 May 1960) in which a US high altitude intelligence flight over Russia was shot down and the pilot, Gary Powers, was captured. 2. Kruschev walking out of the Paris summit on 16 May 1960 leaving a furious President Eisenhower in his wake. 2. The US decision (July 1960) to isolate Cuba including suspending all sugar purchases (80% of the Cuban economy was dependent upon Cuban sugar sales to the US). Russia stepped up and bought the entire crop thereby wiggling their way into the good graces of Castro which would bear dividends for half a century. After Krushchev walked out of the planned summit, he cancelled Eisenhower’s trip to Russia. US-Russian relations dropped to a new low though the two leaders “knew” each other much better than any other set of leaders. President Kennedy and Premier Krushchev met on 3 June 1961 in Vienna for a “formal exchange of views.” The big issues of the time still included the fate of Berlin. The Soviets wanted to simply absorb all of West Berlin into the Soviet Zone. In addition, Cuba and Laos were world hot spots. The Bay of Pigs invasion of Cuba, backed by the US, had been a failure in April of 1961. Many of Kennedy’s advisers approached the upcoming summit with dread so close to Kennedy’s election. Krushchev had been at the pinnacle of power in the USSR for almost two decades and was both a contentious and wily negotiator. They universally counseled Kennedy to avoid an ideological debate – of the Kitchen Debate variety with Vice President Nixon – but Kennedy walked into the trap. Kennedy relied upon his vast font of charm to carry him through almost everything in his life. He arrived for the summit with his glamorous wife, Jackie, in tow intending to charm Krushchev as he had charmed his way into the presidency. Wily, tough Krushchev considered President Kennedy a lightweight and a step backward from President Eisenhower. In October 1962, the Russians would test the new American President in the Cuban Missile Crisis which walked the world up to the nuclear precipice before the Russians blinked. Krushchev and Kennedy took a long walk without anyone else but interpreters in the garden of the American Ambassador’s residence in Vienna. Kennedy’s advisers watched from the residence windows as Krushchev hectored the young President circling him while wagging is finger at him. There were a number of pointed exchanges which came out in the years thereafter. After the failed meeting – was it really a failure or did the American president now know exactly what he was up against? – Kennedy returned to the US and convinced the US Congress to expand Defense spending by $3,250,000,000, triple the draft call for Army recruits, call up the Reserves, and to beef up the Civil Defense Program. These were very robust actions. President Kennedy is never given sufficient credit for these tough actions. The Russians and their East German vassals built Berlin Wall which would stand until 1989. It was built in a single day, 13 August 1961, and symbolized the hard edge of the Iron Curtain. Approximately 239 persons were killed trying to cross the Berlin Wall, but some 5,000 made it. More than 3MM East Germans fled to the west after World War II. More than 50,000 Germans were imprisoned for attempting to escape. The Berlin Wall was the symbol of the failure of Communism and the powerful allure of freedom. The Russians put nuclear missiles into Cuba which became known as the Cuban Missile Crisis, arguably the closest the US ever came to going to war with Russia. For thirteen days, the US planned an invasion of Cuba until the Russians relented. In the end, they removed their missiles from Cuba and we removed our missiles from Turkey. The Turkey action by the US was kept secret for years. On a conspiratorial note, there is a suggestion that the Russians had some hand in the assassination of JFK by Lee Harvey Oswald. OK, dear reader, here’s the bottom line. Behind every summit are issues – Berlin, Cuba, Laos, Syria – which are rarely resolved at the summit. The first step in changing the US-Russia relationship will be engagement. Engagement requires a face-to-face meeting. I was surprised at how much I learned researching this idea. I just ordered Krushchev’s three volume memoirs which are very controversial. When removed from power, Krushchev was imprisoned and dictated these books. At first, American intelligence thought them to be forgeries, but they obtained copies of the original tapes and were convinced of their authenticity. I am looking forward to reading them. But, hey, what the Hell do I really know anyway? I’m just a Big Red Car. Be good to yourself. This entry was posted in President Trump, Russia and tagged eisenhower, kennedy, kruschev, Nixon, putin, russia, summit meetings, Trump. Bookmark the permalink.